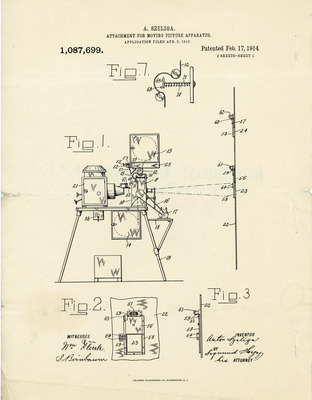 "Patent #1,087,699, Attachment for Moving Picture Apparatus, 1914"
Patent #1,087,699, original printing, United States Patent Office, Attachment for Moving Picture Apparatus, Patented Feb. 17, 1914. “Anton Szeliga, of New York, N. Y., Assignor of one-fifth to Paul Müller, one-fifth to Elias Mauthberger, and one-tenth to Frederick Ticky, All of New York, N. Y.” Application filed April 2, 1913. Serial No. 758, 353. The purpose of this invention was to halt the motion picture projector when the flammable film caught fire, and turn on the house lights. Notes on the exterior in Carl Louis Gregory’s handwriting, “has patents for US, Canada, England, France, Germany pending.” Three sheets of diagram; five of patent text. Diagram sheet number 1.